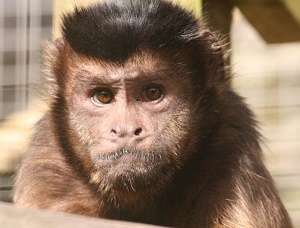 The RSPCA is against keeping primates as pets in the United Kingdom. But, is it legal to have a monkey as a pet at home? RULES FOR KEEPING A MONKEY PET: They are intelligent animals and some people think they are cute. But monkeys and primates have complex needs. It is challenging, and usually difficult, to provide for them in a home environment. The RSPCA are so concerned they released a new report called 'Do You Give a Monkey's'? It highlights the increasing problem for popular primates such squirrel monkeys and marmosets. They claim the animals are suffering in unnatural conditions. Moreover, they are calling for a complete ban on the keeping, and the trading, of primates as pets. There are some 'pet primate' species that live for well over 40 years. That means, much like caring for horses, keeping a monkey pet would be a lifelong commitment. In fact, as monkeys grow old and mature, they often become aggressive in nature. That is a stark difference to keeping 'man's best friend' at home and the general welfare of dogs. There are reasons why a domestic home is not a healthy environment for primates. They need specially-designed accommodation which is often complex to build. Keeping primates indoors creates a common problem in monkey land. Houses are inappropriate for an animal that is happiest living in the wild. People often keep small monkeys as pets in tiny cramped cages. Cramping can lead to abnormal monkey behaviour and, in some cases, self-harming responses. Finding a specialist veterinarian knowledgeable in primates may also be difficult. Not to mention costly! There are health risks when primates cohabit with humans. Disease transmission can spread from monkeys to humans and vice versa. In fact, there have been cases of cross-infection of diseases like herpes and measles. Inappropriate monkey diet is a common problem leading to deficiencies and nutritional disease. Poor diet and a lack of UV light also causes metabolic bone disease in primates. It is wrong to assume that hand-rearing a baby monkey makes for a ‘tame’ adult. In most cases, mothers need to rear their young as nature intended. Separating mother and baby too early causes extreme suffering for both animals. It is not against the law to buy a small monkey from pet shops in Great Britain. They do not perform background checks or issue any licences. That means buying a pet monkey is as easy as buying a rabbit or a goldfish. Keepers of most monkey species need a Dangerous Wild Animal licence. This legislation applies to British zoos and wildlife parks. But, it is not required for keeping the most popular species of tamarins and marmosets. Current regulations fail to protect pet primates. This is the reason for a call to ban their keeping and trade. But, the Animal Welfare Act 2006 does cover primates. Defra produce a Code of Practice for Privately Kept Primates in England. But, general awareness of this guidance is lacking. In fact, it is still legal to sell a primate but you will need specific paperwork for selling some species. The Wildlife and Countryside Act makes it an offence to release a primate into the wild, or allow it to escape free. Monkey World is an organisation that assists many governments around the world. The UK based company helps to stop the illegal smuggling of primates that get taken from the wild. Is it Legal to Own a Monkey in the United Kingdom?